The launch of Fall Winter is always one of the most exciting campaigns of the year. New styles, colours, visuals and a chance to make a big impression. 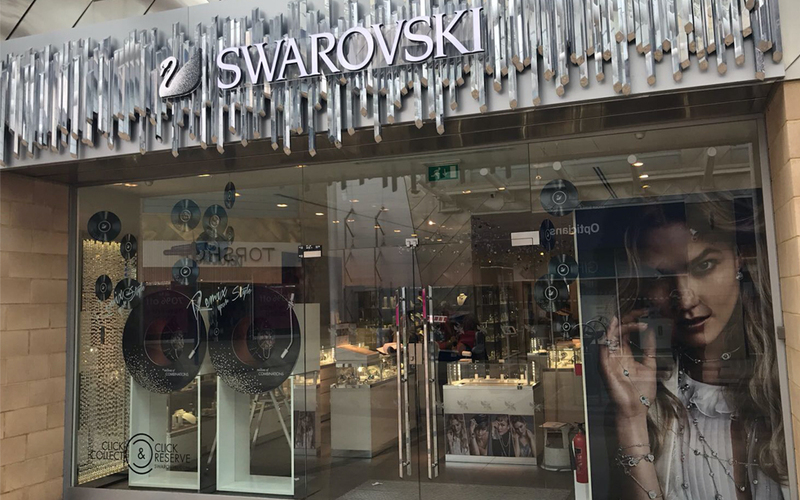 We have spent the last couple of weeks planning, organising, producing and installing bespoke props for the Swarovski UK Fall windows and we are really excited to now share the finished photographs. 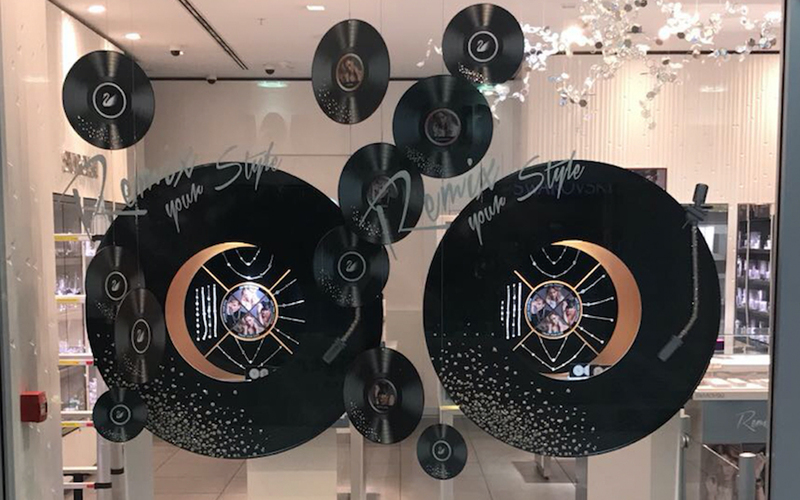 In order to promote their new Remix collection (which we love by the way) the windows take on a vintage vinyl record vibe with giant, Swarovski encrusted records. 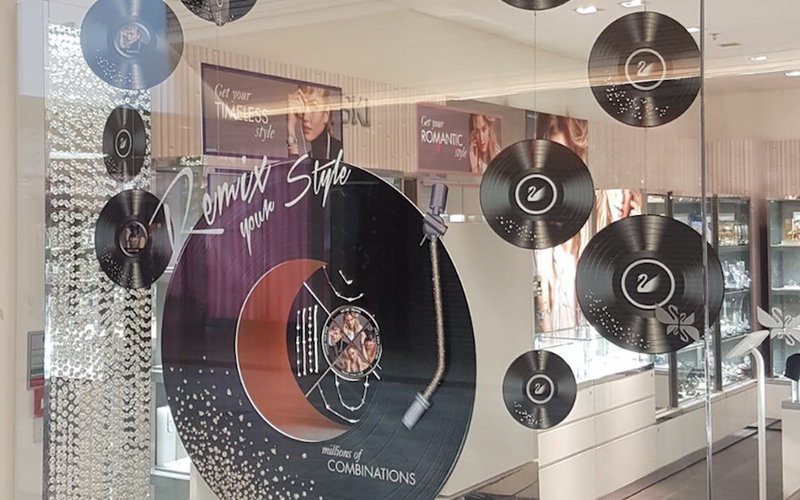 To supplement these great displays, in thirteen locations across the UK, we were given the task of creating hanging bespoke record displays, like mini versions of their large vinyl record. Beginning with the plans of each window, we plotted the number of record runs that would fit and suit each window space. Creating the art working was a pleasure using the four new looks from Brand Ambassador Karlie Kloss – Romantic, Rock Chic, Glam and Timeless and then with the artwork complete we produced test prints followed by the real thing – all in-house – direct to media printed 3mm foamex, cut to shape records (including hanging holes)! A bit of a mouthful but well worth it. The finished records had rich colour and even felt similar to the real thing…a bit like a trip down memory lane for those of us who remember vinyls. Once all the 250+ records were produced, the fun could really begin. 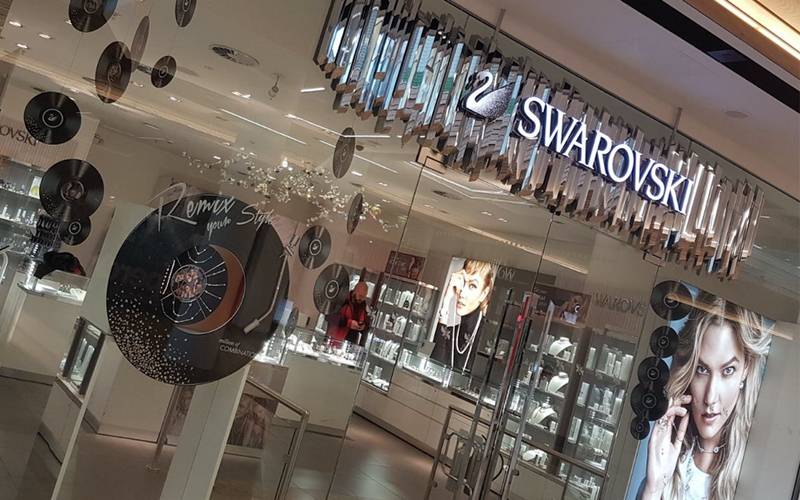 The next stage was to apply over 50,000 self adhesive crystals to the front and back of the records in order for them to really sparkle whilst hanging in the windows. 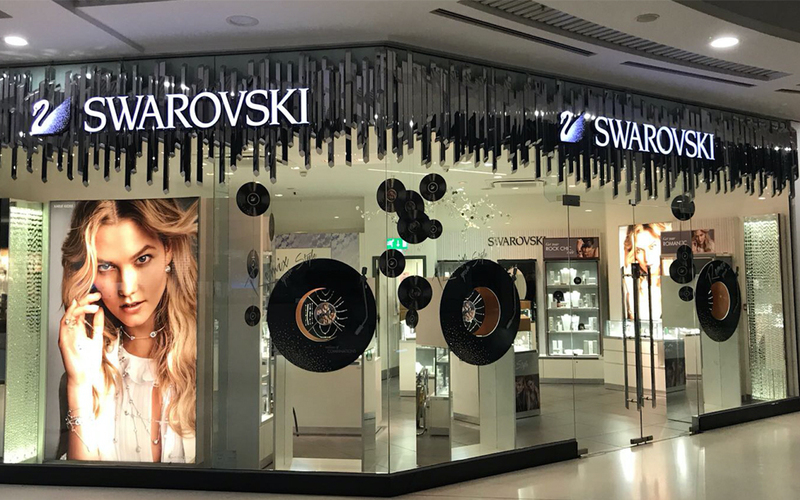 Using three different sizes and shades of crystal we produced a swoosh of sparkle on each record that really shimmers as they gently sway in each window location. When the records were finished (and of course quality checked) we prepared each run using fine 1mm wire, crimps and discreet hanging systems. 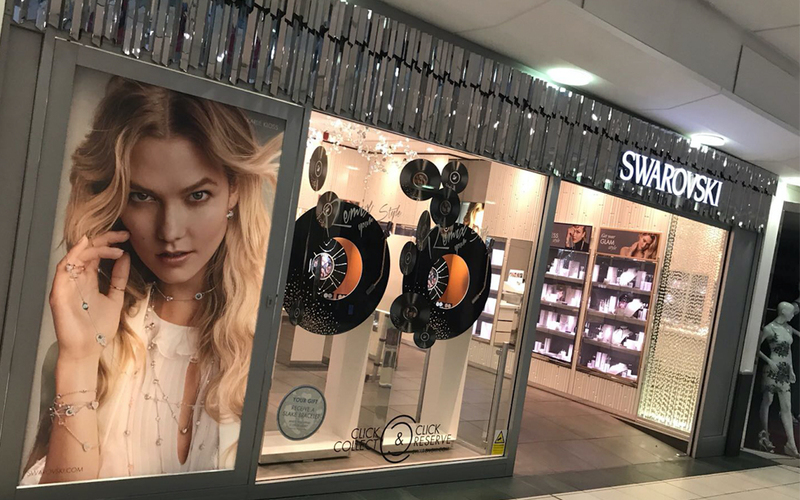 The completed runs were then packaged up and sent off (with detailed instructions and diagrams) to our amazing installation team who then, over the course of three days, visited the thirteen stores to hang each record run. If you require anything from props to prints then feel free to give us a call or drop us an email.